It is summer and time for the another migration to the Chesapeake Bay. 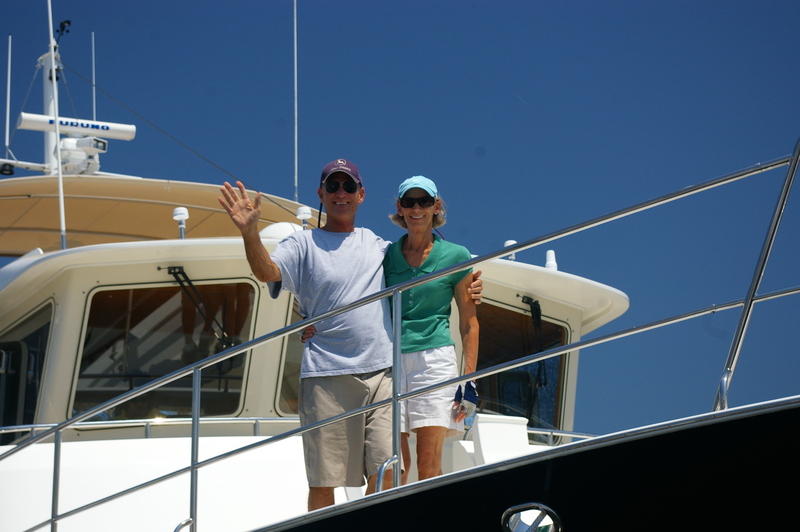 Steve and Sandy asked us to travel with them on a nonstop ocean cruise from Vero Breach, FL to the Chesapeake. 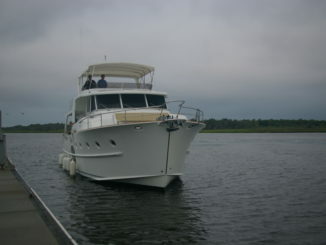 We would be aboard their Kadey Krogen 58 Trawler so we happily agreed. 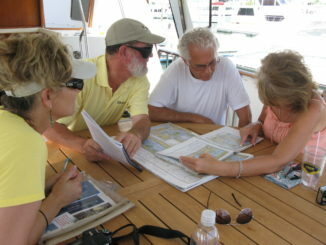 These owners are seasoned cruisers of the ICW so we assisted in their planning process for a four day ocean run- making certain the vessel is ready with both equipment and supplies. Email is a wonderful thing and many notes back and forth allowed the owners to accomplish much before our arrival….we expected no less from these meticulous owners. You would be amazed at their engine room- spotless! On the safety side we enjoyed the confidence of having a life raft and survival suits to accommodate everyone aboard. We always bring our own immersion suits and the owners also saw value in the just-in-case equipment so they ordered two suits for themselves. Navigation equipment included a large screen GPS chart plotter, TWO dedicated radars used on different ranges, close and medium distance and AIS. We could see AIS targets of larger commercial vessels traveling at high speeds in the ocean. Viewing their vessel name, homeport, destination and most important of all, their course and speed allows us to alter course in a timely manner. To round out our ocean cruising navigation equipment we brought along our own Night Vision Glasses. These were later proven to be of great value when we navigated near Diamond Shoals off Cape Hatteras and could not see the buoy in the dead of night without a moon. The buoy showed on the radar, in fact it showed on BOTH radars but visual confirmation eluded us for a while. Ah! THERE it is! And of course we had EPIRBS – one for the boat and our own personal EPIRB on our Survival Suits. The MMSI on the VHF-FM Radio adds to our safety equipment. More exciting planning included our meals that Sandy prepared for us. 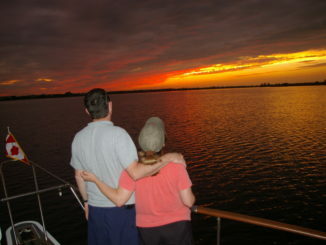 Since Steve used Bob the Weather Router we were assured of good weather the entire trip. This meant we ate well, no beanie weenies for us. Casting off from Vero Beach 7 AM Sunday morning we entered the ocean at Fort Pierce Inlet. The beautiful CALM Atlantic ocean welcomed us as we turned north setting the autopilot. We arrived in Norfolk Ocean Marine Marina at 12 noon on Wednesday. Although the seas picked up and 6 to 8 foot waves were the norm this was a beautiful ocean run in a stabilized Kadey Krogen. Check out the video and see for yourself!